The truth of obesity is that it’s really about a judgment. It’s not about reality. Note: Please allow 24-48 hours for your prerequisites to be confirmed and digital downloads to be emailed to you. Would you like to be happy with your body, whether you get skinnier or not? The truth of obesity is that it’s really about a judgment. It’s not about reality. It’s a judgment. It’s a judgment that was created by others based on what they decided was actually obesity that actually has nothing to do with what’s true for your body. What does your body want to be or do that you’re not acknowledging? 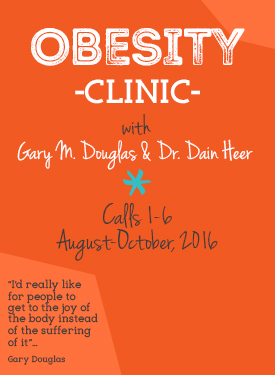 Join Gary Douglas and Dr. Dain Heer for these very special calls. Gary Douglas pioneered a set of transformational life changing tools and processes known as Access Consciousness® over 30 years ago. These tools that are on the creative edge of consciousness have transformed the lives of tens of thousands of people all over the world. His work has spread to more than 170 countries, with over 5,000 trained facilitators worldwide. Simple and so effective, the tools facilitate people of all ages and backgrounds to help remove limitations holding them back from the freedom to live and create a life they truly desire.